The race for developing the best gun led to the production of this battlefield predator. 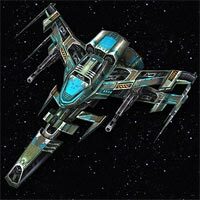 Using exceptionally modernized impulse engines, it is found to be incredibly fast and capable of amazing maneuvers unlike any other ship so far. The Guardian has an energy field surrounding it, which is the reason for the rather big structure. It's armed with the latest design of gaus cannons. Despite its lack of exploding power it has a strong piercing power making a bigger group of Guardians deadly, even against ships of higher class. All these qualities make the Guardian one of the dominant ships on the battlefield. Cargo: 800Attack: 2500Ship hull: 27000Speed: 15000Gas consumption: 300Cost: 20000 Metal, 7000 CrystalsWeapon: Ion; Armor: 12% Light; (in Universe 3 the ship uses 12% HEAVY armor)Improvements in Factory: 8% per level.